Great TITLE…high five. Anyways, the topic at hand. Ilya Bryzgalov signs in Philly just before the draft this past summer. FINALLY the Flyers have solved that pesky goaltending issue that’s hung around that organization for a mere decade or 2…or 3. Big market/no money Phoenix couldn’t afford to re-sign him. Instead they went and got Mike Smith who has been injured and inconsistent since when? Oh that’s right, since he was in Dallas. And what did he do when he was in Dallas? Well by the time he was dealt to Tampa in the Brad Richards deal Smith was considered one of the top young tendy’s in hockey and an elite backup. The kid was putting up unreal numbers. But they had Marty Turco. Turco had been putting up unreal numbers his whole career. 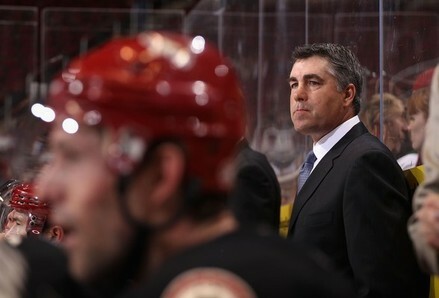 He took over as the number 1 guy in 03, the same season Dave Tippett stepped behind the bench for the Stars. Turco was an elite NHL goaltender from 03-08. Then came 2009. Dave Tippett is fired, Marty Turco’s game goes into the tank. Turco is really terrible in 2010, his first full season without Tippett behind the bench. Meanwhile in Phoenix, Dave Tippett gets his 2nd head coaching gig and he gets as his new starter Ilya Bryzgalov. Bryzgalov has a reputation at this point of being a kook who is very inconsistent and while having talent isn’t really a guy that you can rely on to really carry a team. In 2010, he becomes an elite goaltender. Sets the world on fire, a top 3 tender in the league. 2011, more of the same. Maybe not top 3 tender, but very similar to what 2010 was, and top 5 for sure. Both seasons he carries a Phoenix club that has virtually no talent to the playoffs. Now as I stated before they got Mike Smith for 2 years/4 mil. Because it’s Tampa and people pretty much only pay attention to them when they’re good, but people forget that Mike Smith was a bust for the “ning”. This kid was the big get in the Richards deal for my good buddy Jay Feaster (another sweet move Jay). The Yotes once again with virtually no talent, going through the mess of the Kyle Turris holdout, going through yet another season where it’s a guarantee they will move, are hanging tough (shout out to NKTOB) in the Western Conference. How has Smith been? Outstanding. How is Bryz doing in Philly? Inconsistent though much too early to tell either way. Solid for the most part…so was Bobrovsky last season, Ray Emery, Martin Biron, Robert Esche, Roman Cechmanek, Brian Boucher, John Vanbiesbrouck, Sean Burke, Garth Snow, Ron Hextall, Tommy Soderstrom, Dominic Roussel, and Ron Hextall. Point I’m making obviously is that Tippett’s system is clearly a huge reason for these goaltenders performing so well yet it doesn’t seem to get recognized as such. The man is a tremendous head coach, in my opinion a top 5 coach in the league despite his teams being very “Lemaire” for entertainment. And as for the Flyers sinking that much coin and that many years into a kook like Bryzgalov…I hope for the Flyers sake it isn’t yet ANOTHER swing and miss by Philly management at a legit number 1, but that possibility is definitely real. We will find out in April just how much of it was Tippett.